When preparing for your Portofino vacation, one thing you might not have thought but should definitely pack is your hiking boots. The quiet beauty of the area is so breath-taking and irresistibly inviting to explore on foot. 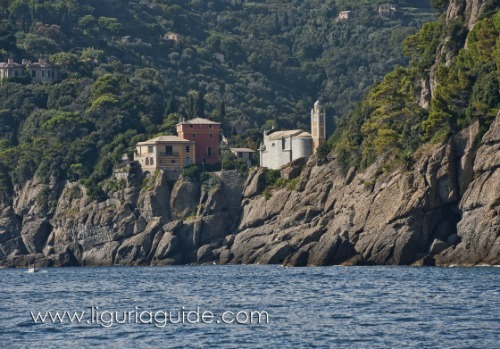 It is part of the Natural Park of Portofino which is one of the oldest natural reserves in Liguria established in 1935. Its lush Mediterranean vegetation and stunning views over sea and countryside alike make the reserve one of the most popular in Italy. The reserve area is kind of square in shape with its western part looking like a rocky cliff overlooked by a wooded mountain. The southern part of the Promontary appears as a sheer cliff dropping straight down to the clear blue sea. It includes Punta Chiappa and the Portofino Lighthouse as well as the inlets of Cala dell’Oro and the breathtaking San Fruttuoso and its Abbey . The area facing onto the Tigullio Gulf is more like a wooded hillside sloping downwards to the sea right to the Point of Portofino. One thing you are guaranteed though is being surrounded by sheer beauty and lush vegetation. In the areas overlooking the sea you can walk along Mediterranean bushes, scrubland and Holm-oak groves, while when you get more inland you will be surrounded by chestnut groves as well as mixed woodlands of downy oaks and hornbeams. The Park has a rich network of hiking paths winding its way through it ready to be explored. Most of them are fairly easy walking trails becoming slightly more strenuous towards the mountain. The one taking you from Portofino to the inlet of San Fruttuoso. And the other, quite an unusual one organised by the Reserve authority, is called ‘Via dei tubi’ that takes you along the old aqueduct which supplied water to the town of Camogli. The Portofino shores are part of the Portofino Marine Reserve and are one of the most uncontaminated areas in Italy. Treating yourself to a boat tour not only allows you to enjoy the sun and the sea but also appreciate the beauty of this stunning coastline from a different view point. There are different options here – during the months of April through to September, there are regular ferry services connecting Portofino with the nearby towns of Santa Margherita , Rapallo and others in the Tigullio Gulf as well as the main towns in the Gulf of Poets and the Cinque Terre. The rugged coastline and the stunning sea waters in the area guarantee lots of adventures for the fans of the water sports . All kinds of sea sports can be practised here, especially sailing, canoeing and windsurfing. Some inlets and stretches of the coastline can only be reached by the sea so sailing or paddling along these spectacular shores is a real treat and an experience to remember. Scuba diving has a long tradition in this part of the Liguria Riviera and the Portofino reef is considered a real paradise spot for divers. They are attracted to the area because its sea waters are extraordinarily rich in habitat and fish, coupled with a rocky sea bottom , often sheer cliffs (Promontory of Portofino, Punta Manara, Punta Baffe) and a high number of wrecks . The most famous wreck being the Mohawk Deer in front of Cala degli Inglesi. 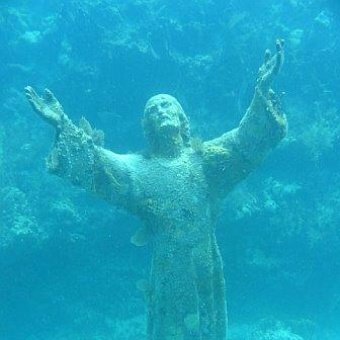 Another must do dive is the Christ of the Abyss situated in the waters near San Fruttuoso . As almost everything in San Fruttuoso, diving in this spot is a unique experience. 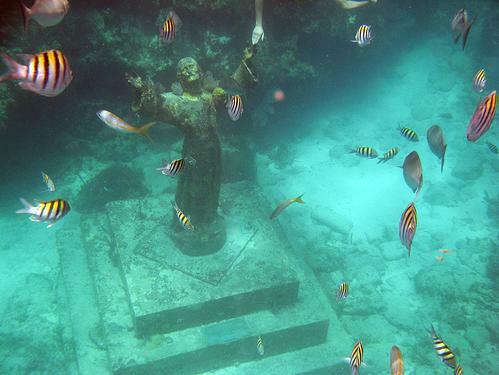 Amongst the natural beauty of the Protected Marine Area you are greeted by the open hands of the Christ statue directed towards the sky (surface ) in sign of peace. The dive is fairly easy as it takes place in relatively shallow waters and has the protection of the Bay against strong winds. The area is famous for its excellent diving conditions ensured by its relative distance from large rivers and the ‘tramontana’ northern winter wind which flattens the sea and provides crystal clear waters even in winter. This allows the Portofino Diving Centre to operate all year round. Another fun way to explore the area is to hire a bike and ride along many of the cycling trails along the Promontory and Punta Baffe. The more dedicated cycling fans can also explore the popular high altitude tracks in the Sturla, Aveto and Fontanabuona valleys as well as the trails along the valley bottom such as the one linking the Five Towers between Chiavari and Leivi as well as the trails that cross the medieval townships of the Val Graveglia and Val Petronio.